As we sped towards Koh Tao on our catamaran, having made the journey from Bangkok to Koh Tao, we were excited to catch a first glimpse of our first official destination for our round the world trip. Around 45 minutes into our crossing from Chumphon, we caught sight of Koh Tao, and its defining green peaks and boulder ladden coastline. We were excited, and sea sick. Never before has a plastic bag been unwrapped and emptied of its contents so quickly! Exiting off the catamaran onto the pier, we were quickly flung into the hustle and bustle of Koh Tao. 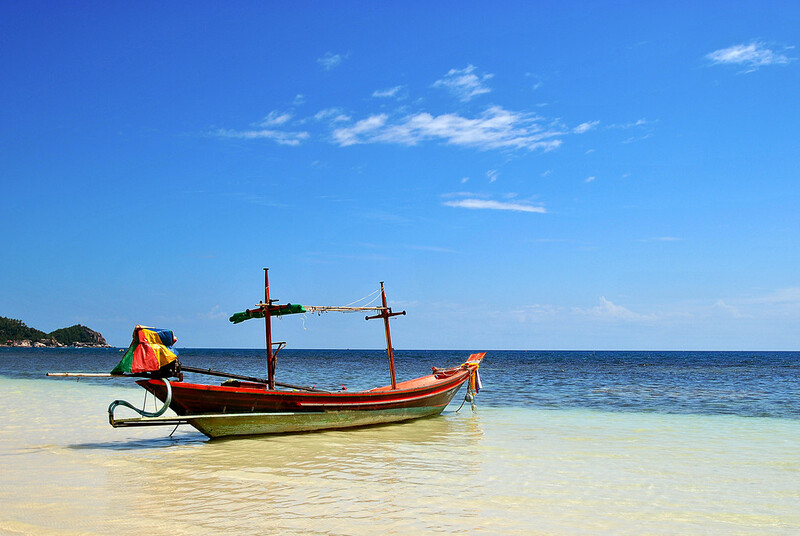 Thankfully, the hustle and bustle of Koh Tao consisted of about ten taxi ride offers and that’s about it. It seems that’s as busy as it gets here. We quickly jumped into a taxi jeep and took the five minute hilly drive along the only concrete, single track road on the island to our accommodation for the next ten days. The island still seems relatively undeveloped which was exactly what we were looking for! 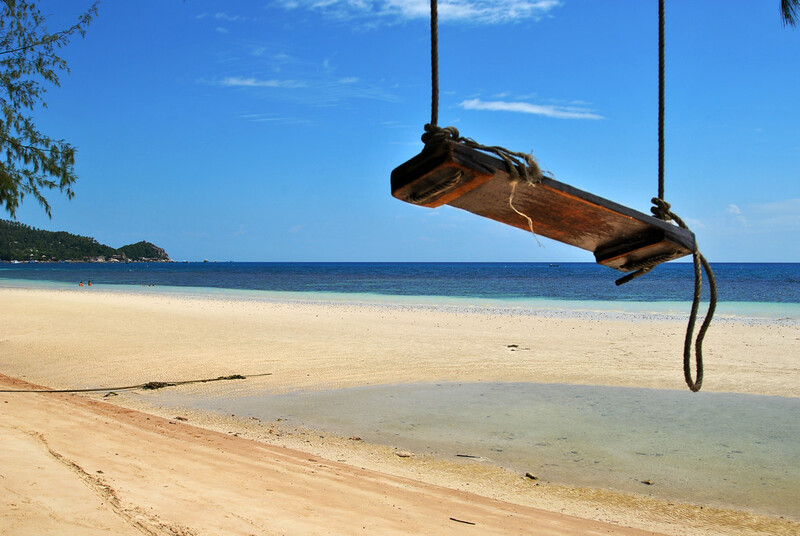 So what are our first impressions of Koh Tao? Well anyone who has done a google search for Koh Tao will know it’s famous for diving, with numerous diving schools lining the coastline. We can confirm the stories of turquoise waters and white sandy beaches to be spot on! From the few days we’ve spent here, the island seems to have a rustic feel to it, harking back to a time when travellers first started visiting the island twenty years ago or so. Despite the development of small bars and restaurants along the coastline and coves, the natural vegetation of the island still adorns the coastline, intermingling with the beach huts and shacks. There’s something for everyone, from those who want a beach hut and diving lessons, to those who want a remote hut in a cove with a handful of other huts, all bases are covered. There’s also a rap loving meditator just down the road from us who spends all day chillaxing. He sells beer and has a room for rent if you’re interested! 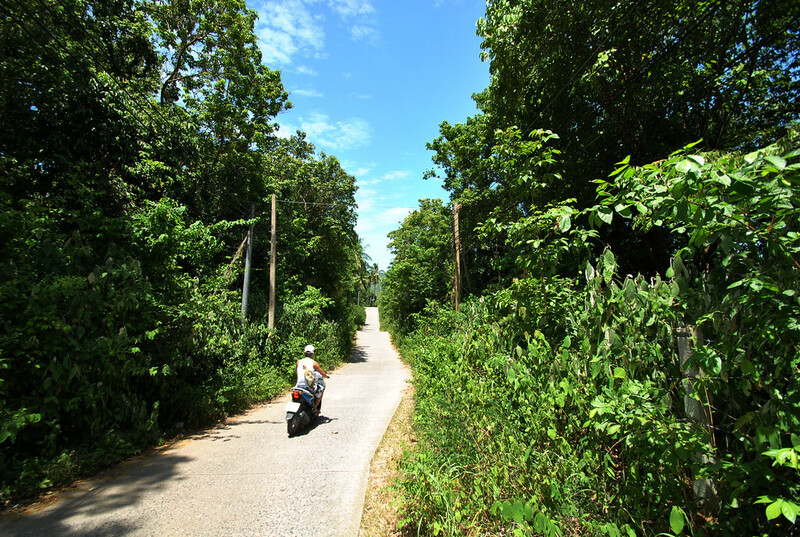 Want to know how to get from Bangkok to Koh Phangan? Or from Bangkok to Koh Samui? Check out our other articles! I never made it to Koh Tao but It sounds pretty awesome. Looking forward to hearing about your experiences there. I may have to add that to the list of places when I get back there. I also need to update my diving cert it sounds like! 🙂 Cheers! Thanks Adam, Koh Tao seems brilliant for divers! Shame we’re not really that interested, but we’re going to do a one day taster course to get a feel for it anyway. I’m sure we’ll get an article up about it! So exciting you’ve started your trip already! Looks like your first destination is a good one! Looking forward to see how you decided to spend your days there! Thanks Vicky, Koh Tao has been a perfect preparation for the rest of the journey! We were both exhausted after the wedding and packing up our flat, so we needed a couple of weeks to prepare for the rest of the journey. Not long until you’re off now, our advice is give yourselves a week somewhere to prepare for the rest of the trip! Thanks for the tip! We’re starting our trip in Japan which hopefully will not throw us into a huge culture shock and with the super efficient trains and polite locals we should be able to ease our way into long term travel! Some tough decisions ahead guys, make sure you take plenty of time…..aka beers to decide! Great intro to Koh Tao! We loved it there and the diving is fab, almost as good as the tasty seafood! Enjoy! Only 139 days till we meet in Chile, how scary is that!! Don’t worry, we’ve had a few cold ones whilst making our decisions! We had some great seafood last night, especially the ceviche so looking forward to more tonight! 139 days? If the rest of our weeks go as quick as the first one we’ll be there in no time! An amazing place worth ten days!!! Hope to have a chance next time to Thai. Thanks Lisa! It’s a great island to spend some time on, especially exploring some of the quieter and more remote beaches! And of course you can get to other nearby islands pretty easily as well so well worth making the journey! Are you planning on scuba diving? It’s incredible there!